Being asked about my sanity to invest into Join!, the start-up of an airline network, this article is about “cheap pizza” or why I still think it is a good idea to start a regional airline today. 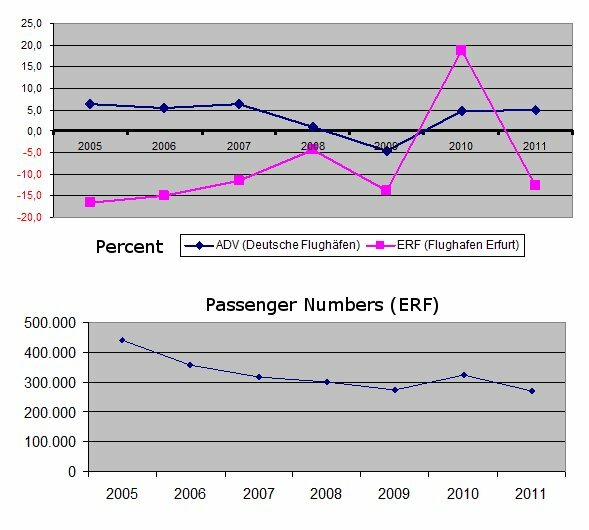 In order to complete my statistics about the passenger development before / during / after I’ve been working at Erfurt Airport, I had a look at the monthly development, as well as the annual one of Erfurt and Germany (published by ADV.aero) and Europe and the world (published by IATA) as a comparison. IATA reports EU, with 9,5% growth 2011, the second strongest market in the world. That is behind Latin America, but before Asia! 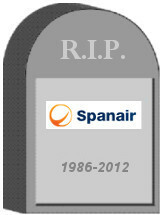 The market being challenged by political mistakes, increasing the tax burden on aviation. Milking aviation until it collapses instead of strengthening it in its role to attract and support commerce is sure short sighted expression of ignorance. Unfortunately, this political development makes Europe at the same time the global area with the lowest profits world-wide and – to my understanding – has forced the collapse of a number of routes, airports and airlines in the past year. Where the failure of one, opens the opportunity for the other. ADV confirms Germany, having added aviation tax in 2011, to have only grown by 5,0%, visibly below EU-average. This may also be a result of the struggling by Air Berlin and Lufthansa to cover up for the resulting strain on profits, closing down a number of routes, focusing on their hubs. Which opens opportunity on several of these abandoned routes. Recently, Cirrus Airlines and Spanair, the one being a code share partner of Lufthansa, the other being a Star Alliance member, ceased their services and filed for bankruptcy, leaving more routes unserved. The failure of one opens the opportunity for others. Airplus (leading credit card provider for companies and business travel) reports that the business travel in Germany will increase exponentially compared to other markets. At the same time, the average air fares are increasing. There are some airline operational models, that can be used exclusively or in a combined operation. Hub carriers usually operate one or several hubs, routing passengers from and to smaller places through their hubs into their networks. This is mostly the classic way, airlines operate since the 1980s. In those days, the airline took the financial risk to establish new routes. Challenged and responding to low cost carriers, their ability to do so has eroded. Low Cost Carriers compete with, making them virtually a mix between hub carriers, regional airlines and charter operators. They operate point-to-point-services with larger aircraft, offering ability to start with lower air fares. They temporarily profited from the fact that airlines had to build war chests to finance the establishment of new routes. Meanwhile they come to recognize that operating an airplane is a cost factor and as the established airlines responded to their threat, the advantages they built upon increasingly eroded. Regional Aviation is usually referred to as the operators of smaller aircraft of up to 100/120 seats maximum. Their focus is to establish air services for regional airports with limited passenger numbers. Using smaller aircraft, they can operate higher frequencies required by business travelers, still being of less interest to the low cost airlines, usually operating mid-size jet aircraft (100-180 seats) with a lower frequency and focusing less on the business traveler’s needs. Business Charter usually fills the gap, where the operation for a scheduled service between two airports is not supported by the passenger numbers needed, but business travelers need to go either on a customized schedule and/or traveling between airports not connected by existing scheduled services. Just to complete the picture: Tour Operators have aircraft flying leisure travelers seasonal between their point of living and their place of vacation. The aircraft can be owned by the tour operator, it can be charted exclusively by a single one or a group of tour operator(s), or it can be offered to the tour operators. As such, there is a business opportunity for airlines focusing on operations for business travel, to offer their aircraft on weekends, midday or night to tour operators. On the positive side: Hans-Rudolf Wöhrl, who already founded NFD (today Eurowings), later bought and turned arouned DBA, now joined into the board and invests in Intersky, a smaller regional airline in Friedrichshafen, Germany. So why attempting to launch a regional airline just now? The major carriers straighten out their networks, focusing their routes to serve into and out of their hubs. Low Cost operates usually larger aircraft, accommodating the leisure traveler with lower frequency. Many routes are served once to trice a week only, making them less likely to be of interest for business travelers. On the other end, business aviation reports a surge in demand. 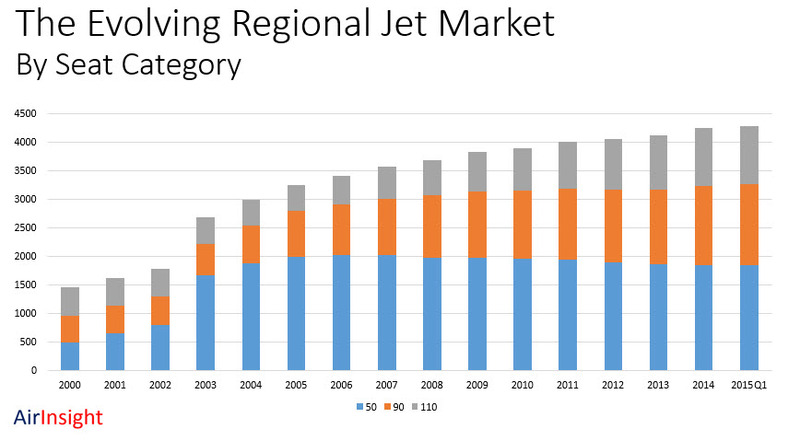 Likely the increasing demand for business aviation reflects the reduction of flight services by scheduled airlines (be it major airlines or low cost). Business travelers are not as focused on the air fare. It must be competitive, but their focus is frequency. If needed, they charter the aircraft to enable the necessary business trip. So it needs careful route analysis. How many people will travel between A and B? Flying between A and B with a 50-seat aircraft twice-daily service (daybreak) plus twice on the weekend at 80% load factor generates 25.000 seats a year. That means 25.000 return tickets to be sold – of 50.000 one-way tickets. Double this for a 100-seater… And when you fly that, what do you do with the aircraft between the morning and the evening rotation? Can you utilize it at night? An aircraft standing around looses money. So you better consider the options for a secondary service that utilizes the aircraft in midday. And if you have local tour operators interested to charter the smaller aircraft for their services, utilizing it on the weekends or at night adds to improve the return-of-investment for the aircraft and its operations. But yes, no matter how well you qualify your route potential, it remains a risk. So you got to find investors to believe in your route analyses and believe (or need) it. You can also talk to other involved parties or bodies, such as airports, chambers of commerce, politicians, companies and reduce the risk by having commitments for tickets. Remember, we talk about 50.000 one-ways every year… But in the end – this does not have to be subsidies, it could be commitment to sell a certain amount of tickets. That said: There are many routes, which require business-frequency with smaller aircraft and would not work with lesser frequency but bigger aircraft (and fares), as the business traveler would not fly only one-way. Increasingly, the retreat of the major carriers from the regional airports opens up opportunities for smaller airlines. Our idea of a “network” offers those small, “individual” operators access to know-how, distribution, services and quality usually available only to larger scale of operations. Every failure or retreat from a route or airport opens opportunity for someone else. Though the times, the airlines’ take the risk alone are over – if you start up, you better find out, who comes with you on the journey. Food for Thought. And yes, I appreciate your thoughts.